Before May 2017, the average charge for inter-bank funds transfers across Nigerian banks was 100 Naira per transaction. However, the CBN recently issued an edict to all Nigerian banks which stipulates that from May 1 2017, commercial banks are to charge exactly 50 Naira for funds transfers to other local banks. Interestingly, while the CBN guide separates the charges for inter-bank and intra-bank transfer for micro-finance banks, there's no such distinction for commercial banks. Hence, it seems to be at the individual bank's discretion to decide the charge (or lack thereof) for intra-bank transactions. In spite of the bank-wide reduction in electronic transfer charges, there are still cheaper ways to transfer money between Nigerian bank accounts without using a bank-controlled channel. I share the details of the ones I'm aware of at the moment below. FUN FACT: Did you know that the .ai TLD (top-level domain) is for Anguilla? 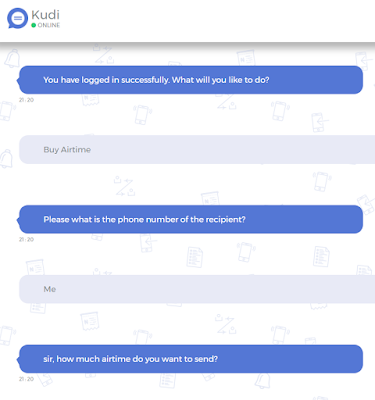 Kudi.ai will also allow you do the other usual electronic transactions like buying airtime and paying utility bills. As at the time of writing this article, the only payment option available for use on kudi.ai is the ATM card linked to your bank account. So far, I've been able to use my GTB Naira Mastercard and my Fidelity Verve card successfully on Kudi.ai. I won't be surprised though, if when this really gains transaction, Nigerian banks started blocking their cards from working on kudi.ai as a way to slow transaction income leakage. I think that would be a huge blow from the banks in the epic Bank vs. FinTech battles. If this happens, it won't be the first time a Nigerian bank pulled that kind of move. Back in 2013/2104 when Interswitch Quickteller gained a lot of traction, it did not take long for GTBank to restrict their customers' usage of Quickteller for electronic transfers. Of course, this meant that the customer had only one option to transfer money out of their GTBank account; use a GTBank-controlled channel (online/mobile/USSD/branch). Thrivesend charges 45 Naira only for local bank transfers. Just like Kudi, the only payment option available is your ATM card . As long as that remains the case, services like this only survive as long as each Nigerian bank allows its card to work on the platform. Sad. Is there a CBN edict that would prevent a bank from doing this? I'm curious. Es sir; but haven't you heard of Kudi.ai yet? Talking about sharing card details with third parties reminds me of a time when I tried to get my friend to sign up to Zoto app. Signing up requires entering your card details into the app and doing an OTP/token verification against your bank. For one, my friend was wary about using his card on yet another 'Nigerian' app. Also, the trouble was apparently not worth it, considering the existence of very seamless USSD recharge which everyone in Nigeria who has an ATM card account today can potentially access. So, that my friend, is how I missed a golden opportunity to win free 1000 Naira airtime (Zoto referral reward) for me (and my friend). Obviously, even 1000 Naira free airtime was not enough motivation for my friend to join the Zoto app. I can only imagine what the fate of Zoto would be when their airtime-sharing spree comes to an end. The odds are just against a mobile app if the same service it offers is easily accessible over USSD. If you know of any cheap or free electronic transfer method within Nigeria which is not listed here, kindly share the details in the comments section below. After due verification, the article will be updated accordingly. Great job fam. I love your blogposts. Always informative and exciting. To the issue at hand. I have used Kudi.ai twice on web and sent money with my GTB MasterCard. I wasn't sure if I was charged the first time but my book balance was higher than my available balance by some NGN 105. I sent money to a Keystone bank today and I did my calculation. Book Balance is NGN 50 higher than Available Balance. I am of the opinion that this is the service fee for interbank transfer that I'm being charged by using Kudi.ai. My Account is current so I don't know if this is a factor. Weirdly, I don't see the transaction log on my internet banking dashboard and I am yet to get an alert but I have been debited by the amount sent and an extra NGN 50. I have also not gotten an email or SMS alert. I don't know why I have been lazy to type and send my observation to the Kudi folks and I'm here typing epistle. I guess anointing to type just fell on me. And yeah, I have not had the chance to appreciate you for the help you offered me some two years ago when I was trying to start a PAYG solar energy Business. The business didn't kick off due to forex issues and poor market research + misfit in management team. However I'm thankful for what you taught me. You should definitely send your observations to the kudi.ai team. The last time I used my GTB mastercard on kudi.ai, I noticed my available balance was about 200 Naira lower than my book balance after the transfer. You are very right. I observed my NGN 50 has been returned. So yeah, with kudi.ai, one can make interbank transfer for free. There is a new app, the name is AirSender Nigeria, which provides a channel for interbank transfers. It may not necessarily be cheaper than bank transfers but it's just marginally more expensive but the app does not have any monthly hidden charges or daily transfer limit. It doesn't even use your bank for transfers as the app has an e-wallet. So you can make transfers even if your bank is offline or you do not have enough funds in your bank account. Did I mention that there are no hidden charges and no transfer limit? The app also has basic utilities like bulk sms and airtime purchase and the airtime is discounted by 1%. That's N500 absolutely free on N50,000 accrued purchase. The name of the app is AirSender Nigeria. On AirSender Nigeria, there is no daily transfer limits. As long as you have sufficient funds in your e-wallet, you can transfer any amount anyway you want. Rumor Roundup (June 17, 2018): Rousey schedule, plans for Jax match, women’s tag titles, more! Online money transfers have turned out to be progressively advantageous in a wide range of exchanges. There are such a significant number of online platforms, offering the administrations today and to get the best rates you should, in any event, think about.